AUTHOR INFORMATION: Kelly McCullough is an international best-selling writer who has previously written the WebMage series which mixed Greek mythology with computers & hacking. His short stories and poetry have been published in places such as Writers of the Future, Weird Tales, and TOTU. He has previously worked on The Chronicles of the Wandering Star—an illustrated serial novel which was part of a middle school science curriculum—and the science comic Hanny & the Mystery of the Voorwerp which he co-authored and co-edited. He currently lives with his wife in Minnesota & their pet cats. OFFICIAL SYNOPSIS: Once a fabled Blade of Namara, Aral Kingslayer fought for justice and his goddess alongside his familiar, a living shadow called Triss. Now with their goddess murdered and her temple destroyed, and their brethren dead or outlawed, they are among the last of their kind. Aral survives on the fringes of society, working as a shadow jack. He smuggles goods, protects thugs, and occasionally stoops to thievery. His is a trade lacking honor but one that keeps him alive. A drunken, broken, and wanted man, he sees no way out. Until a mysterious woman hires him to deliver a secret message-one that can either redeem him or doom him. The price she offers is suspiciously high for a simple job, but Aral is bored, broke and fond of expensive whiskey. Prodded by Triss to take the commission, he soon discovers he’s not intended to deliver a letter but rather to witness a clandestine meeting. And the message, with all its questions and consequences, is meant for him. 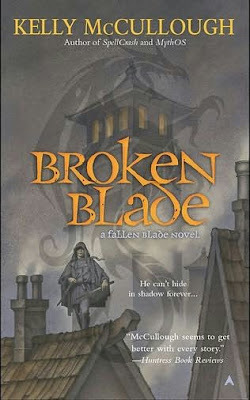 November 29, 2011 marked the mass market paperback & e-book publication of Broken Blade by ACE books. Cover art is provided by John Jude Palencar. ANALYSIS: I had first heard about the book earlier this year and later again when Anne Sowards specially mentioned it in her FBC interview as well. I had caught up with the author’s previous work, the Webmage series earlier this year and very much enjoyed the technology laced, Greek mythology inspired narrative. After learning more of the book and its setting, I was very curious to see how the author would handle the story and the characters. Aral Kingslayer was a blade(assassin) of Namara, the Goddess of justice and was exceedingly good at his vocation. Delivering justice as per Namara’s directions, the world was a safer place. However the other Gods didn’t like Namara’s meddling and soon banded to dispose of her and her acolytes. Since that day Aral has slowly spiraled into a life without meaning and he has tried to escape within the swirly confines of whiskey. The story then begins with Aral finding himself down on his luck again and seeing trouble approach in a red dress. He is then asked to deliver a message for a fee which deems the entire endeavor a very risky one. Unsure of whether to take the offer and what his benefactor’s intentions are, he hesitates. But his shadow familiar a dragon named Triss forces him to take the job as it means that the job will bring in the much needed money as well give Aral something to do besides slacking off. He then agrees to take the job and goes to deliver the message however the fly in the pie turns out to be that he’s not just a messenger. He is intended to see what happens when two particular people come to meet & what it is they have to discuss. The story to begin with is a dark one, usually in such situations the protagonist often has a something to back upon, however in this story the murder of the Goddess is something which has led to this situation. The main character of Aral is not overtly heroic; he’s an assassin to begin however his actions were always dictated by the Goddess. While this sounds very cool, there’s a duality to his action, from the eyes of the Temple, Aral & the rest of his comrades are the arms and weapons of justice. Doing their best to correct the imbalance of the world however if seen from a viewpoint of a neutral party or even those who were affected by Namara’s actions. Her temple and its assassins seem no more than crazed magical warriors who decide to kill people as per the wishes of their Goddess. This ambiguity is a bit touched upon the author and never fully revealed, leaving the readers to draw their own conclusions. Aral’s character however is a deeply troubled one and he’s lost his way since the fall. The characterization by the author fleshes out the main protagonist very nicely and also showcases a lot of his personality along with that of his familiar Triss, significantly highlighting the reasons behind Aral's fall and his subsequent attempt to live a life of some meaning. The overall plot thread is a mystery as the author slowly doles out the clues and the reader along with the main protagonist have to string them together to figure out the real happenings. The world setting created in this series is also something which draws the reader in to the story and makes sure that the reader realizes that a lot of thought has gone in the making of this world. There’s also the currency, the calendar of 370 days spread over 11 months of 32 days each, also each month being further divided into 4 weeks of eight days. This and much more is packed into this 300-odd paged story, this creative world building really helps the reader to immerse themselves and ingrain themselves within this world. The world and backstory however are barely scratched in this series opener and with atleast two more volumes to be released, there will definitely more to know and read about. One of the points wherein the story might lose the reader interest is the lack of pace in the middle third of the book wherein things are sprung on the main characters. While there were quite some revelations, the pace got flagged amidst it all and this might detract from the reading experience. Another thing which is only hinted at but never clearly touched upon is the pivotal event of the Goddess's death, these traumatic events casts a long shadow over almost all of the events in the book and however beyond a few conversations not much is clarified. Perhaps the author wished to reveal his cards a bit later but some more shedding of light would have helped in understanding the depth of the tragedy. The ending while a quick one is definitely a satisfying one and this helps to overcome all the aforementioned hurdles. The author leaves more than enough threads up in the air for the sequel Bared Blade and for the readers to linger a bit more in the world of Aral and Triss. CONCLUSION: A strong beginning to a new fantasy-mystery hybrid series which proclaims that Kelly McCullough is definitely not a one-series wonder. Broken Blade hits all the right points and while still having some vagaries to its name, it does effectively manage to captivate the reader to the world of the Fallen Blades.